With more accidents taking place every day, it seems even the software world is becoming more safety conscious and so recently a plethora of data recovery software lining up every day. It's beyond common reasoning to understand as to why so many companies are producing their own recovery software. After all, it's not photo-editing software that can have a number of brushes and effects to boast. Well you can always boast a new plugin you made for Photoshop (if you can). It ain't even a media player with all new presets and a bag of things to categorize and clog the web with its 'what's new in xyz' stuff. We're talking about file recovery software here. All you can imagine is a tiny window that lets you select the devices attached to your computer and you've to select the one you want to recover from. We have been having our hands on a number of data recovery software and plan to come up with an article on the best ones we experience. After touching tails of a few of them, in the line this time is 'Glary Undelete'. Even before we start to tell you about its features and give our angle to the product, the one thing we'd like to share is the simplicity with which the product has been designed. While we were experiencing a few other data recovery software, it was quite evident to see that most manufacturers are either too inclined towards making the software look elegant and cheesy while others are too resilient to pay any attention to the same. Sometimes, it was the beautifully designed circular buttons which made us 'woo' and sometimes it was the poorly done ones which showcased either laziness or boredom or carelessness or all of them. Most other data recovery software were bent upon showing off their modules they'd like us to see and understand how each of them work. If you ask us, we opine that a person who just wants to get his data and documents back, which he lost due to some misfortune doesn't really care which module is to be used to perform the task successfully. When it comes to Glary Undelete, it's just a single screen and doesn't make you understand rocket science before you finally figure out what is to be done to get your precious back. Simplicity - Well, we don't really know if 'simplicity' can be said to be a feature of a product, but we must say (as we have spoken in the paragraphs before) that we highly appreciate the idea Glary have put to reality. Instead of a dozen buttons to make you go wild and frenzy enough to fist your monitor and burn the CPU before you can actually do some stuff, Glary Undelete comes with a single screen. Nothing doing! 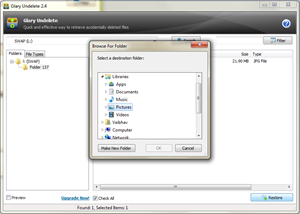 All you have to do is select the drive you believe the file was in before you deleted it or happened to have lost and click on the search button. If Glary happens to find the file you were looking for, it'll show the same as an item in the list below. If you find a million files in the list, you can use the side panel that lets you select the file type you were looking for. If it's just about a few images, why worry scrolling down and under to find the fluffy? Just select the file type and there you go. If you're lucky enough to have your file in good state, you may be able to recover it successfully. And in case you want to preview the file before you actually do some restoration, there's an option at the bottom left you can check out and Glary Undelete will let you preview the file if it's in its capacity to do so. Seems as though we're short of words in appreciating the good looks and ease-of-use which it has to offer apart from anything else! Format Support - Glary Undelete is blessed by its maker to be able to perform on all major file systems – NTFS, FAT and NTFS+EFS, as they say. In our case, it was NTFS and we must say it worked well. The recovery module of the product is efficient and does the job without making you choose from a bundle or modules one by one. 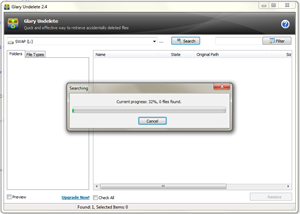 It supports a huge number of file formats that it can recover. Is it a compressed file (containing some media or data or some further compressed files) you want to bring back to life? Is the file fragmented into chunks? Or is it some sort of encrypted data? Glary Undelete comes at your rescue in all cases, no matter how bad is the situation. Of course, you cannot blindly blame them if it doesn't work out for you, but it worked well in most cases. After all, no data recovery company can ever give you a cent-percent guarantee of success. Devices Supported - Like many other rivals of its kind, Glary Undelete boasts support for a number of devices. You can recover files from damaged and corrupted hard drives and from removable disks as well. You can try your luck with USB keys, flashes, memory chips, external hard drives and CDs and DVDs for the purpose. One of those products we tried recently could work on Android phones and bring back data. Smart Filter - Well, we won't say this is a feature you don't find in any of those data recover software, but certainly – this is important. Glary Undelete has a smart filter in store for you. No, it doesn't have a crazy set of options which make you close the very window the moment you get your eyes on them. There are just four options. You can directly put the name of the file you are looking for and click OK. If not, you can sort stuff out using size and date of the file's presence. And if you still don't want to waste too much time, just select the state of the file. So, if you have a number of USB drives on which you remember having copied some rare tracks of your favorite artists of the 1980s and you hope to get them back, just insert them one by one and if the Gods wish, you can retrieve all of them. And in case you don't want to disappoint yourself seeing files that you've recovered not working, select the filtering of state to very good and it shall recover only those files which are in good state. As we've already said, there's not too much that particular software like this can offer. Yes, we agree there are products which offer support to a wide variety of devices, like phones and all but given the competition, if every company starts doing the same thing, there's nothing left on grounds of which they can say "our product is different and better". If you talk about Glary Undelete, it is clear as a crystal that the manufacturers have deliberately made the product in a way which does nothing to annoy the user. It is purely a different thing whether it delivers the job perfectly or not (after all, nobody guarantees, right?) but provided the simplicity it has to offer, we'd say – "It's a product worth going for." One thing we fail to appreciate too much is the fact that Glary don't have their website as detailed as possible. There could be more FAQs and guides to help the user out during calamities. Overall, a worthy pick.